WINNER OF THE PULITZER PRIZE AND "NEW YORK TIMES" BESTSELLER The liberation of Europe and the destruction of the Third Reich is a story of miscalculation and incomparable courage, of calamity and enduring triumph. 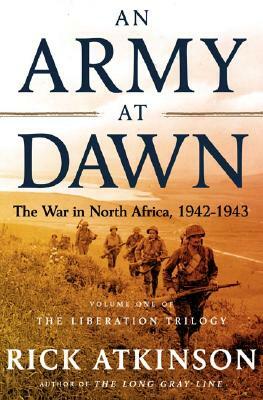 In this first volume of the Liberation Trilogy, Rick Atkinson focuses on 1942 and 1943, showing how central the great drama that unfolded in North Africa was to the ultimate victory of the Allied powers and to America's understanding of itself. Opening with the daring amphibious invasion in November 1942, "An Army at Dawn "follows the American and British armies as they fight the French in Morocco and Algiers, and then take on the Germans and Italians in Tunisia. Battle by battle, an inexperienced and often poorly led army gradually becomes a superb fighting force. Central to the tale are the extraordinary but flawed commanders who come to dominate the battlefield: Eisenhower, Patton, Bradley, Montgomery, and Rommel. Brilliantly researched, rich with new material and fresh insights, Atkinson's vivid narrative provides the definitive history of the war in North Africa.